The Grid Fitting module provides a way to align a grid ontop of many individual points to aid in alignment of the image or to create a concise separation of objects in a grid pattern. 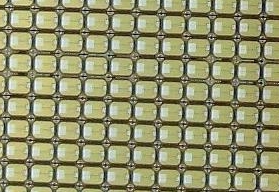 This can be used as part of a segmentation process to break multiple periodic objects into individual cells that can then be further processed. 1. Precursor - Ensure that the image before the Grid Fitting module contains white objects in a grid or periodic pattern. The module will calculate the center of gravity of each object to use as an anchor for the grid alignment process. Note, this is assume to be a black and white image. 2. Draw Grid - Specifies that the found grid should be draw ontop of the Source Image. This is useful when attempting to break apart objects for additional processing where their boundaries are not well defined. 3. Align Image - Causes the Source image to be aligned in accordance to the detected Grid. This is helpful when the grid needs to be repositioned in a known orientation for further processing. 4. Source Image - The image that constitutes the pixels behind the current black and white blob image. 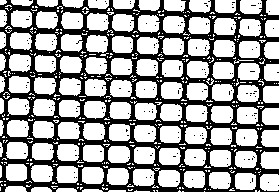 The module expects a black and white image with white blobs being points that constitute a grid. 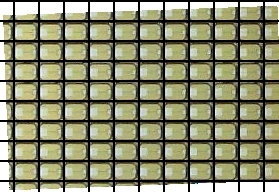 Once the grid has been found applying the transform to the source image is typically what the module is used for. 5. Desired Grid Width/Height - When aligning the grid you can specify the desired size of the grid elements. This is useful when you want successive images of the grid to be scaled to the same dimensions. 6. Out of bounds Color - When the image is aligned parts of the resulting image may not map from the source image. The out-of-bounds color specifies what color to make these parts of the resulting image. 7. Draw Grid Color - The color to draw the detected grid. 8. Thickness - The line thickness to use when drawing the grid. Note, a single pixel line may not be sufficient to disconnect blobs. 9. Display As Annotation - Draw the grid, but only on the second pipeline pass so as not to affect subsequent processing due to the drawn grid. The source image to be aligned based on a grid like pattern. Use adaptive threshold module to binarize the image and identify the cells that are part of the grid pattern. Use the Grid Fitting module to detect the grid and align the image correctly with 20x25 pixel cells. GRID_FITTING_ERROR - Number of pixels off the fitting of the Grid is.